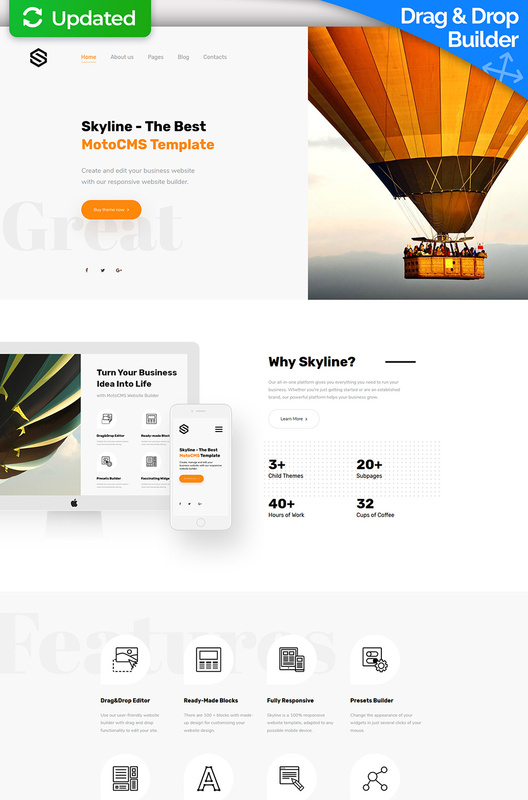 Skyline Multipurpose Business Website Template is a ready-made solution for launching a web project with any purpose. Represent your business with 20 originally designed pages and choose the main layout of your site among 4 extra home pages: Skyline Black, Dental, House Construction and Travel. Build successful online business thanks to the admin panel from MotoCMS that combined the block editor with more than 100 made-up content blocks and the large collection of widgets for customizing your website with no special skills. Launch social media to increase your brand awareness and Google Analytics to track all important data. Create a stunning business blog to publish articles in two twos. Optimize content for each page of your site with SEO tools. Enjoy Skyline on any device thanks to 100% responsive design and much more. Sprzedano - 67 szt. tego szablonu.